Paying a privatised English water company to provide Scottish public water to Scotland’s public services has to be the ultimate in market madness. An article in yesterday’s Sunday Times reports that the Scottish Government is about to award a massive contract to provide water and waste water services for most of Scotland’s public bodies to Anglian Water, which is based in Huntingdon. If you thought we had a public water service in Scotland, you might be a bit confused at this stage. Well we do, but it’s looking a bit frayed at the edges. Scottish Water is a public corporation (even if it often wrongly calls itself a ‘company’) accountable to Scottish Ministers and the Scottish Parliament. Scottish Water is responsible for the provision of water and waste water services to almost all domestic and non-domestic properties and for maintaining the public system. There are some small scale private water supplies, largely in rural areas. However, there is competition in the provision of customer-facing activities such as billing, charge collection, meter-reading and complaints handling for non-domestic customers in Scotland. This means that Scottish Water levies a wholesale charge on licensed retailers for non-domestic customers. Licensed retailers can agree their own charges with customers, subject to them being no higher than a default tariff set by the Water Industry Commission Scotland (WICS). Scottish Water is also a retailer, through its own retail arm Business Stream, which provides a service to the vast majority of non-domestic customers in Scotland. As the public bodies are non-domestic customers they come under this system of retail competition and the Scottish Government, actually the then Infrastructure Secretary Nicola Sturgeon, put one big contract for public bodies out to tender last August. The driving enthusiasm for non-domestic competition was the WICS CEO – a well known supporter of privatisation. So keen that he promoted the scheme’s extension to England and Wales. UNISON has always argued that this arrangement is an expensive waste of effort. The WICS claims it has resulted in savings, but in practice these savings are all about water efficiency, not marginal differences in billing systems. Non-domestic competition is not the only area of privatisation. Last year the insider web site ‘Utilities Scotland’ submitted FoI requests to ascertain the extent of privatisation in the delivery of the water and waste water capital programme. In the last four years, 92.5% of Scottish Water’s capital programme has been delivered by private contractors, 7.5% by Scottish Water staff. By any standard that is substantial privatisation. This is on top of PFI schemes run by a variety of privatised water companies. There is a certain historical irony in the Scottish Government exporting Scottish jobs to Huntingdon. The Earldom of Huntingdon was held by Scottish kings, most famously by David 1 in the 12th century. He used the revenues to build several abbeys in Scotland and generally spruce up public buildings. On the other hand, Oliver Cromwell came from Huntingdon and he knocked down quite a few public buildings in Scotland. Also, a later Lord Huntingdon was a custodian of Mary, Queen of Scots – that didn’t end well either! Scottish Water is a public sector success story, but we are only too aware that there is a powerful lobby for privatisation. As I said in yesterday’s Sunday Times, the gradual drip of privatisation will have reached a new high if this contract is awarded to Anglian Water. 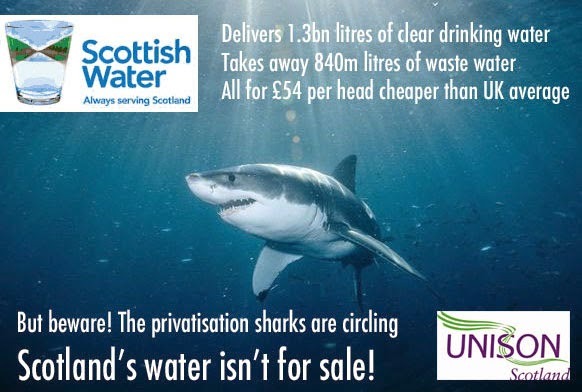 The privatisation sharks are still circling Scottish Water and we need to remain vigilant. Scottish Power profits have increased by 41% year-on-year in its generation and supply business for 2014. This comes after the Competitions Authority said the Big Six providers, including Scottish Power, were overcharging loyal customers by £234. Scottish Power's parent group Iberdrola reported an increase in profits to €139.1 million, from €81.2 million in 2013. They also gained 10,000 new customers. However, profits were down 17% at the company’s SP Energy Networks business from €578.6 million to €479.7 million. Profits were also down in UK renewables with net profit €55.9 million in 2014 compared to €130.6 million in 2013. Iberdrola chairman Ignacio Galán had some interesting comments on offshore wind, he said: "One of our key priorities is to play a leading part in reducing costs for offshore wind and we believe that our large scale future projects in the UK will be able to deliver power at a significantly lower price than many people expect. We are looking to a future when offshore wind will be competitive with fossil generation, contrary to some expectations." In contrast Centrica, which trades as Scottish Gas, announced a 35% cut in profits. The retail business had a 20% cut in profits, attributed to lower retail consumption due to 2014’s historically mild temperatures. However, losing customers has also played a part in the weaker results. The report by the Competition and Markets Authority (CMA) shows that the Big Six energy companies are charging their most loyal customers up to £234 extra a year. Labour's Shadow Energy Secretary, Caroline Flint said: "Energy bills are £300 a year higher under the Tories. 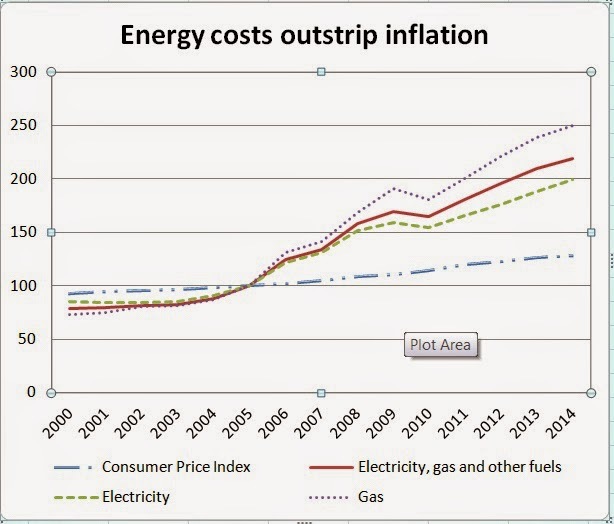 The number of families with children who cannot afford their energy bills is at a record high. Time after time, David Cameron has ignored warnings about rip-off energy bills, opposed Labour's plans to reform the energy market and create a tough new regulator, and let the energy companies get away with overcharging millions of consumers. 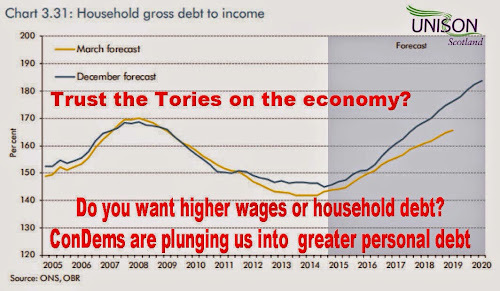 Households and businesses cannot afford another five years of this." While true, Flint is not proposing to take radical action to break up the failed energy market. A market that has failed the most for the people who have the greatest energy need. Ofgem, the government regulator of the energy utilities is simply myopic and sees no other solution to the problem than providing even more market. The Morning Star leader was typically direct, they said: "Ofgem's primary concern is not to advise Britain’s gas and electricity customers on how to obtain a better deal from their energy suppliers, but to maintain private ownership when even the dogs in the street know that the industry is one big racket." Philip Pearson at the TUC is more measured, but also points to the long term trends in his analysis. He says that customers who did not switch were more likely to be on low incomes, over 65, living in social housing and without qualifications. Customers on Standard tariffs were also more likely to be disabled, a single parent and struggling financially. The CMA report has made it abundantly clear that the corporate-controlled energy system isn't working and we need a radical new approach. More than £10bn of Scottish taxpayers cash goes on buying goods and services in the private sector. This procurement activity could do much more to deliver the Scottish Government and other public bodies policy aims. Last year the Scottish Parliament passed the Procurement Reform Act and the EU passed a new Procurement Directive. These provide a framework for a new approach to procurement, but need to be transposed into regulations and guidance to make it work on the ground. Procurement is a devolved matter and it has has to be said that the Scottish Government is making a much better fist of implementation than their UK counterparts. However, progress is slow and the approach is still too cautious and risk adverse. A key objective for trade unions has been extending the Scottish Living Wage through procurement. The Scottish Government has a good record on supporting the living wage, but procurement has always been the weak point. We had expected the Procurement Reform Act statutory guidance on the living wage to be in place by now. However, this has been delayed. As an interim measure a Scottish Procurement Policy Note, 'Evaluating employment practices and workforce matters, including living wage, in public contracts' has been published. While this is not as good as statutory guidance and has some omissions, it does explain how public bodies can legally ensure the living wage and other employment matters are included in contracts. In local authorities in particular, legal and procurement advice has persisted with the erroneous position that the living wage and other workforce matters cannot be included in contracts. This policy note is helpful in challenging that advice and includes a practical case study piloted by the Scottish Government and model specifications. The Local Government in Scotland Act introduced provisions, known as s52 guidance, that is supposed to end the Two Tier workforce, ensuring that council contractors pay the same wages and offer similar terms and conditions to directly employed staff. New evidence that councils are ignoring the requirements of s52 comes in The Third Annual Report Scottish Local Government Benchmarking Framework. They report an 8% increase in privatised social care services and this, "has contributed to reduced costs through lower salary and pension costs". There could not be a clearer admission of unlawful procurement in an official report. On many occasions the STUC and individual unions have raised with ministers the need to promote and enforce these provisions. Sadly, little has happened and again it is not even mentioned in the new advice note. The Scottish Government has also published a consultation on the transposition of the latest EU Procurement Directive into Scottish procurement regulations. There are a number of options available to ministers and we will be pressing for a much more radical approach in line with the 'Ten Asks' we promoted with a network of civil society partners during the Procurement Reform Act's legislative journey. A good example is tax dodging. As I explained in the Sunday Herald, the consultation paper is weak on this point and the Scottish Government could do much more. For example, by adopting the Fair Tax Mark. 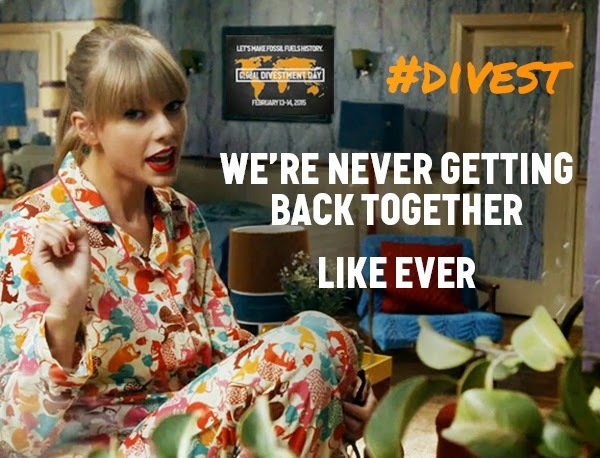 A Scottish company, SSE was the first company to sign up to this. Similar initiatives could make a real difference in promoting stronger environmental action, development goals and fair trade. It isn't possible to specify everything we would want explicitly in procurement regulations. However, it is possible to change contractor behaviour by spelling out the standards we expect from organisations who take the public pound. That can be a powerful force in promoting the fairer Scotland most of us want to achieve. Scotland and the UK needs a pay rise. It's necessary for hard pressed workers and their families, but it's equally vital for the economy. The next two week's will be Fair Pay Fortnight, a series of events across the country that will raise awareness about Britain’s cost of living crisis. Working people in the UK are seeing their living standards squeezed harder and harder every year. Workers in Scotland have lost nearly £2000 since 2010 and while jobs may be returning to the economy they’re increasingly low paid, low hours and low security. This has happened because the economy has seen a big shift from wages to profits. You have to go back to the 1860’s for a pay squeeze as long as this one. 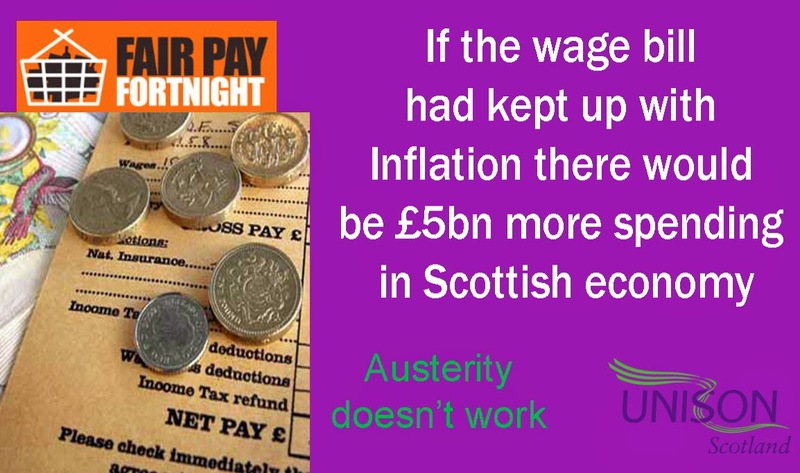 If the wage bill had just kept up with inflation there would be £5bn more spending power in the Scottish economy. It is low wages that has delivered the slowest recovery recovery from recession since records began. The UK government is also collecting £33.4bn less in income tax and national insurance than official forecasts suggested because of the lack of earnings growth in the UK, according to independent analysis in 'The living standards tax gap just got bigger', a report published today by the TUC. This analysis is based on the wages forecast made in June 2010 by the Office for Budget Responsibility (OBR). If earnings growth had been in line with the OBR forecast, income tax and national insurance receipts this year would total £308.4bn. But the Treasury is now expected to collect just £275bn. This could have delivered nearly £3bn of extra spending on public services in Scotland and is almost half the austerity cut on the Scottish Government budget. Falling petrol prices may deliver a cut in the headline inflation rate, but it only masks the real pressures on family finances. Since 2007 the average rent for a Council House has increased by 26% and in the same time the wages of a Council Worker has increased by 8.3%. UNISON Scotland has published a series of reports in our 'Damage' series in which members describe in their own words the impact of low wages on them and their family. Families have been plugging the gap by using savings or getting into debt. 30% of families say they have less than £500 put away, compared with just 14% in 2013. The scariest chart from the OBR report on the Chancellor's Autumn Statement shows just how much Osborne is relying on household debt to dig us out of the economic mess he has created. Even among those suffering, the pain is not evenly spread. Women in low pay have a pay gap of 34.2% and young workers classed as low paid has more than tripled over the past four decades. As the Poverty Alliance has highlighted today, in work poverty in Scotland is growing, with almost two thirds of children in poverty living in working households. On pay rises, inequality is being compounded by what the CIPD calls a "tale of two workforces", with public sector workers most likely to see their pay held down. 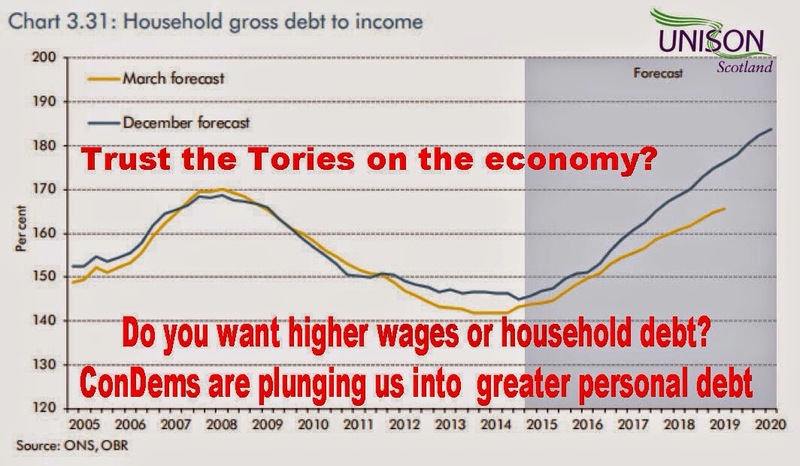 In contrast, the wealth of the richest 1,000 people in Britain doubled to £519 billion since 2009, about two and a half times the annual deficit. FTSE 100 Directors had a 21% pay rise last year and now earn 123 times the average Scottish full time worker. In 2000 that ratio was 40 times. 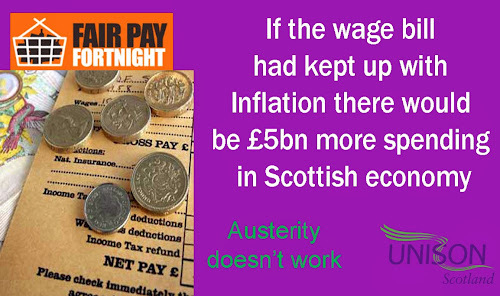 Put another way, they earned the average Scottish wage of £27,045 in just over two days of work last year. David Cameron was making a somewhat belated pay rise pitch to the British Chambers of Commerce last week. In a TV reaction interview after the speech, one such fat cat couldn't stop laughing at the notion. That's why they are all queuing up to donate to the Tories already stuffed election fund. We are doing very nicely thanks - 5 more years please. In Fair Pay Fortnight we will be developing these themes, making the case for greater fairness in our economic system. Scotland and the UK really does need a pay rise. Keir Hardie's centenary year is an opportunity to remember the contribution he made to our movement and keep alive the ideas he championed. "I am an agitator. My work has consisted of trying to stir up a divine discontent with wrong". This is classic Keir Hardie and for me what he was all about. Academics can pour over his words and look for deep meaning, but for me he wasn't a great theorist, he was an agitator. He took the message of socialism to hundreds of thousands of ordinary people across the UK and changed the way a generation thought about what was possible. 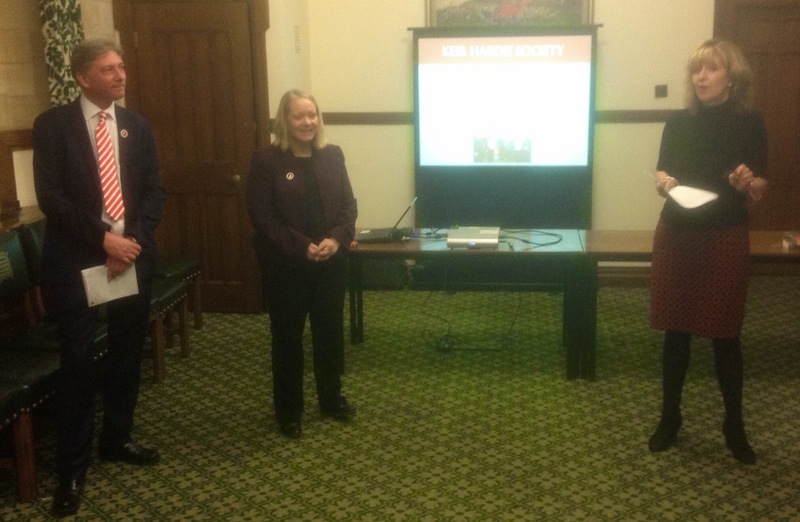 2015 is the centenary of his death and last night I was at Westminster with the Keir Hardie Society to launch a programme of events we are planning this year. Our first Honorary President was Tony Benn, and his daughter Melissa opened last night's event with her own thoughts on Keir Hardie's legacy. There was no alcohol at last night's reception - Hardie would have approved! Cathy Jamieson MP and our Secretary, Richard Leonard, outlined the programme for the year that includes meetings at UK and Scottish Labour Party conferences, lectures and a book of essays in which writers will address different aspects of Keir Hardie’s life, ideas or main achievements. The Scottish Labour History Society conference this year will focus on Hardie and discussions with several council's are well advanced on developing Hardie Trails in the areas he lived and worked. There is a planned reprint of Hardie's classic "From Serfdom to Socialism" and a local schools project. There was a good turnout of Labour MPs from around the UK, reflecting Keir Hardie's appeal across the country. I put together a Powerpoint presentation of visual media for last night's event and I was struck by how many parts of the UK remember him in street names, health centres, schools and many other buildings. While the society is based in Scotland, we never forget that he was an MP in Wales and London. He also had an international perspective and traveled extensively across the world in solidarity with workers everywhere. Yes, he was a supporter of Home Rule, but James Keir Hardie was no nationalist. While Hardie was a founder of the Labour Party and its first parliamentary leader, he was first and foremost a trade unionist. Sacked as a mine worker in 1879 with his brothers in Lanarkshire by the colliery manager for speaking out; "We'll ha' no more damed Hardies in this pit". He would recognise the attempts by the modern day Tories to weaken employment law and the right to strike, for what they are. The UK already has the most draconian strike laws in Europe. Hardie's centenary year is of course an historical event, a reminder of the labour movement's great traditions. However, it will also put Hardie's life and work in a modern context - stirring up a divine discontent with wrong! Staffing targets are the wrong approach to public service reform. In the run up to the UK general election, political parties are tripping over themselves with commitments on the number of nurses, police officers, teachers etc. We need a more grown up understanding of what makes a real difference to public service delivery. We tell ourselves that the independence referendum was a zenith for political debate. Scotland led by example with village halls and community centre’s bulging at the seams, with families, friends and communities engaged in informed debate on social and economic policy. We say it was empowering, engaging and exciting. We are the most politically informed populace in the world. If true, this has to be the time to show it. Scotland needs a grown up debate like never before. Not just where powers lie or who is more left wing or more Scottish than who? But what kind of country do we want to live in and how do we want to be governed and are we willing to make the decisions to make that happen? The downside of this type of political pledge is the whole debate becomes a stats trading war on nurses, doctors, police, and teachers rather than a real debate on public service improvement. Scottish Labour leader Jim Murphy kicked off with an announcement that if elected he will introduce 1,000 extra nurses. Of course our NHS needs more nurses. But the NHS is a large complex organisation seeing increased demands on the whole staff team not just in the NHS but in local government and voluntary sector too. The real national disgrace in the care sector is in homecare. Today’s ‘Seen something? Say something’ campaign on adult harm is very welcome. However, we have large numbers of homecare workers scared to report abuse because they are on zero or notional hour’s contracts. The NHS cannot improve if we neglect the staff who provide social and community care. Social workers, home carers, occupational therapists and others reduce queues at A&E through early intervention and they free up hospital beds by providing personal care at home. It is equally ridiculous for political parties to compete on police numbers. The SNPs pledge to keep an extra 1000 police officers; or to maintain 17,234 police officers in Scotland has been a disaster. If we truly are the most politically educated populace we will know that the chances of a bobby on the beat catching a house burglar as he is climbing through a window is the stuff of The Beano. Crime has been reduced to its lowest level ever by finger print officers, crime scene investigators, anti-fraud officers, intelligence analysts, forensics, custody officers, and many more working with the police. These people have high technical skills. They all help keep us safe. But right now Police Scotland is cutting £1bn from the police budgets. Our police officers are politically protected so who else is going to lose out? Of course its the said civilian staff who work with Police fighting crime. This is actually the worst kind of politics, and should not be tolerated by one of the most politically educated people in the world. Surely we understand that taking police officers off operational duties to cover for civilian specialists, at twice the cost, makes a mockery of Best Value? Last week’s political spat was about teacher numbers. Teacher ratios are just one way of protecting educational standards. There is little point in having better teacher ratios if classroom assistants or administrative support are being cut. The Scottish Government rightly takes credit for reducing ring-fencing of local government. So why reintroduce a policy that says we in Edinburgh know best how to deliver education in every community. It’s another unhelpful focus solely in inputs. The Christie Commission said we should put a focus on outcomes. In reality we need to ensure that we have the right range of inputs and sound processes that lead to the outputs that will deliver better outcomes. We are clearly building up to the same debate on early years and childcare. Parties are queuing up to out do each other on promises of who can deliver the most hours, to the most children, at the lowest cost. Where is the debate on flexibility, women in work, work life balance, gender and childcare, the links between schools and nurseries and quality of provision. And whether we should provide early years childcare with low paid private sector staff. Public services are complex and joined up. Staff need properly rewarded and trained, and yes, that costs money. We cannot have the public services we all say we want, and pay less tax. Scandamerica is an insult to our intelligence. We need to properly debate the council tax freeze. It cannot continue. It is the wrong policy at the wrong time. We have had 40,000 job losses in local government in recent years, there are 40,000 more job cuts in the pipeline. Surely we should at least have an honest debate about fairer local property tax accepting there will be winners and losers. We need to seriously debate our public services and how we reward those who deliver them. We need to debate austerity and how it is decimating our public services dragging the economy down. Simplistic calls on staffing targets don’t help. If we can have a grown up debate, then perhaps we really can call ourselves one of the most politically informed countries in the world. UNISON's case for the full devolution of Housing Benefit has been supported by the respected think tank IPPR. Scotland needs all the policy levers to effectively address our housing crisis. The command paper 'Scotland in the United Kingdom: An enduring settlement', (love an optimistic title!) sets out the legislative provisions to enact the Smith Commission consensus for further devolution to Scotland. There has been some political froth over who holds power over those aspects of welfare that will be devolved. In fairness, consultation clauses are not unreasonable given the complexity of Universal Credit that will remain reserved to Westminster. However, this fuss has masked an important debate around Housing Benefit. The draft legislation gives the Scottish government certain powers to vary the housing costs elements of the universal credit and how they are paid. But as UNISON, and now the IPPR have argued, the case for taking housing out of the universal credit altogether is a very strong one. "…the devolved institutions are responsible for key aspects of the housing and property market. They control not just housing policy and investment, but also planning policy. As a result of the Scotland Act 2012 the Scottish government will also have responsibility for all property taxes. Devolved governments can encourage the construction of new houses in both private and public sectors, and in particular facilitate increases in the social housing stock through investment they make, direct or permit, if they wish. ‘And yet in spite of a stronger understanding of their respective national and local housing market conditions, their unique housing problems, and the housing competencies needed to influence the supply and type of housing, they do not have control over rent subsidy. Control over such a key investment stream is the missing piece of the puzzle for better housing policy and a clearer, more local focus on tackling the cost of housing. ‘First, rent subsidy control would allow the administrations to determine problems and priorities that accord to their local circumstances, rather than policies set in Whitehall (such as the spare room subsidy) which appear to be of little relevance to housing markets in the devolved nations – as evidenced by the deal that was struck with Northern Ireland – but nevertheless can force rent subsidy recipients into destitution. For instance, rather than the Scottish government having to invest resources in reversing the effects of the spare room subsidy, Scotland should instead be making rent subsidy budgeting decisions themselves, in a manner that would target Scottish allocation problems, not ones in London. ‘Second, devolving rent subsidy budgeting could over the long run increase the supply of affordable housing and reduce the costs of rent subsidy. By calculating the long-term trade-offs, devolved governments could target their investment in social housing to reduce the costs of housing benefit. Allowing the devolved governments to use a proportion of housing benefit money to build new social housing, and in turn reduce expenditure on the more expensive private rented sector, would result in socially useful assets (which potentially could be sold when no longer needed) and is arguably a better long-term use of public money. Cutting reliance on the private rented sector by offering cheaper rents offers social tenants a quicker route out of poverty. ‘Third, control over rent subsidy would also bring much more stability and certainty to their substantial housing investment budgets. With the ability to control how rent subsidy policy is made, the devolved institutions can provide revenue certainty to their own public housing investments, and provide a more stable platform for affordable housing supply from the registered social landlord sector. As IPPR has argued elsewhere, the devolving of housing benefit would, over time, potentially contribute to reversing the 30-year drift in public spending from building homes to subsidising rents. In the long run it would be far better to invest more in bricks and mortar than in paying private landlords. The devolved administrations have proven much better at investing in new supply of social housing, and are as a result more active in helping families to reduce the housing cost pressures that have such an impact on policy discussions." UNISON did not argue for the devolution of welfare benefits in total because we accept that there are a number of benefits that should remain a shared risk across the United Kingdom. Mainly because they are cyclical and that creates particular financial challenges for a devolved government. However, this doesn't apply to housing benefit and only the misplaced desire to protect the integrity of the Universal Credit prevented this happening when the original Smith Commission proposals were being developed. The Tories under pressure from the DWP, already in a mess over Universal Credit implementation, changed their position from the original submission. The announcement from Labour that, if elected, they will fully devolve Housing Benefit is a welcome commitment. Controlling all the levers of housing policy is important if Scotland is to tackle our housing crisis.